There’s a wealth of meaning behind some common Jewish words. 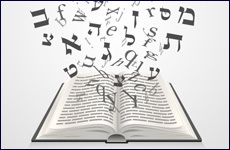 Here are the origins and deeper meanings behind nine common Jewish terms. Test how many you know. Kvell is to swell up with pride, usually for one’s kids. This modern usage comes from the Yiddish word kveln, meaning to be delighted. Kveln entered Yiddish from German centuries ago: the Middle High German word quellen meant to gush up, to well, or to swell. Amen comes from the Hebrew word emunah, meaning belief, faith, credible, authentic and true. The Talmud (Shavuot 36a) relates the two words; when we hear someone recite a blessing, saying Amen indicates that we too accept these words as true. Amen also has a deeper meaning: it is an acronym for the Hebrew phrase El Melech Ne’eman, which means “God, Faithful King”. Thus, Amen also functions as a declaration in its own right, expressing our belief in the Divine. Yiddish went beyond the literal meaning of a person, however. Reflecting Jewish values, a mensch is a person in full, someone who fulfills his or her obligations and does what is right. Kosher literally means fit, proper and appropriate. The term “Kosher” can be applied to a range of items that are governed by Jewish law. Torah scrolls and mezuzahs are “kosher” when they are correctly written and maintained. Legal contracts and documents are “kosher” when they are appropriately designed and carried out, in accordance with Jewish law. Kosher food is that which the Torah permits for consumption by Jewish people. The rules of kosher food are found in the Bible in the books of Leviticus and Deuteronomy, and are expanded on in the Talmud. By observing these rules, Jews are able to bring holiness into all areas of their lives each time they cook and eat. Nachas is the pride and joy we get from our children. A common Jewish sentiment is “may you have nachas from your children”. Nachas comes from the Hebrew word nachat, meaning satisfaction and pleasure. (That in turn derives from the Hebrew lanuach, meaning to rest.) To derive nachas is also expressed in the Yiddish phrase to shep nachas. Shep comes from the Yiddish shepn, meaning scoop. Messiah comes from the Hebrew word moshiach, which literally means anointed with oil. In Biblical times, the title moshiach was given to people who had reached positions of leadership and greatness. The Kohen Gadol, who performed the Yom Kippur service in the Temple, was called the Kohen ha-Moshiach, or the anointed high priest, because he was literally anointed with oil when he took up his position. The title Moshiach is reserved for a future Jewish leader who will become king and begin a period of perfect peace. This Moshiach, or Messiah, will be a descendent of King David, and will restore the Davidic dynasty. Jewish tradition notes that he will be wiser even than King Solomon. It is said that in each generation, a potential Moshiach, or Messiah, is living. When the Jewish community finally reaches its potential and lives according to the timeless laws of the Torah, that leader will arise, ushering in an era of perfect peace. The name “Jew” comes from the name of Jacob and Leah’s fourth son, Judah (Yehudah in Hebrew). The Torah notes that after Leah gave birth to Judah she “declared ‘this time let me gratefully praise God’, therefore she called his name Judah” (Genesis 29:35). According to the great Italian Jewish commentator Rabbi Ovadia Sforno, Judah’s name reflects intense holiness: it not only contains the letters of God’s name, it also contains the root of hodu, the Hebrew word for thanksgiving and praise. Before he died, Jacob blessed Judah with kingship: “The scepter shall not depart from Judah nor a scholar from among his descendants” (Genesis 49:10). Jacob’s prophecy was fulfilled: King David, from the tribe of Judah, eventually reigned over a united Israel. Following the death of King Solomon, the ancient kingdom of Israel split into two: the northern Kingdom of Israel, home to ten of the Jewish tribes, and the southern Kingdom of Judah, home to the tribes of Judah and Benjamin. The ancient Assyrian empire wiped out the northern Kingdom of Israel in the 5th Century BCE and exiled the ten tribes; only the tribes of Judah and Benjamin remained to carry on Jewish tradition. Over the years, “Judah” came to refer to any Jew, regardless of tribe or status. The first person to be called a “Jew” in the Bible is Mordechai, in Book of Esther, which describes the events of the holiday of Purim. The wording is curious: Mordechai seems to be called both a descendent of the tribe of Judah and a descendent of the tribe of Benjamin: “There was a man, a Jew (Yehudi) in Shushan the capital whose name was Mordechai….a Benjaminite” (Esther 2:5). The Talmud discusses this curious wording, concluding that Mordechai was indeed descended from the tribe of Benjamin. “Yet he was called a Yehudi (Judah-ite) because he rejected idolatry, and anyone who rejects idolatry is called a Yehudi” (Megillah 12b). The word for Hebrew in Hebrew is Ivri. (In Hebrew, “b” and “v” sounds sometimes be expressed with similar letters; in the process of translation to English, the “v” became a “b”.) Ivri comes from the word “ever”, meaning the other side. The first person in the Torah to be called an Ivri, a Hebrew, is Abraham, after he and his wife Sarah entered the land of Israel. On a literal level, Abraham and Sarah indeed were “ivri”, or people who came from the other side: in their case, they came from the north, across the Euphrates River. On a deeper level, Abraham and Sarah were from “the other side” as well. The championed a belief in one God while the rest of the world indulged in idol-worship, and they lived lives of upright moral behavior amidst a sea of depravity. The second person in the Torah to be called an Ivri is Joseph, Abraham’s and Sarah’s great grandson, who found himself alone and isolated in Egypt, yet still lived by the moral code he’d inherited from his illustrious ancestors in Israel. After Joseph resists the advances of his master’s wife, the Torah refers to him as an Ivri. After 3,000 years, we, the descendants of Abraham and Sarah, remain Hebrews, people who continue to cling to our belief in God and the moral code of the Torah, even when that means standing apart. In modern parlance, mitzvah often is used to mean a good deed. Many of these mitzvot (the plural of mitzvah) instruct us to live good, moral lives, for instance by giving charity, visiting the sick, extending hospitality. Mitzvot do guide us to lead good lives. Yet the meaning of mitzvah goes much deeper It means commandments given to us by God. The word mitzvah is used 300 times in the Five Books of Moses. Jews are obligated in 613 mitzvot (the plural of mitzvah); Gentiles are obligated to perform Seven. In Jewish thought, actions profoundly affect our very being: what we do shapes who we are. By performing mitzvot we are aligning ourselves with the goals of the Divine. The word mitzvah is also related to the Aramaic word for join, tzevach. When we do mitzvot we are attaching ourselves to a greater good, elevating ourselves in the process. As taken from, http://www.aish.com/jw/s/Deeper-Meaning-of-9-Common-Jewish-Words.html on June 7, 2017.